Step 7: Write the piece. 1. What made the study interesting or surprising? 2. What “take-away” message was there for Fitness readers? Obviously this was a short article, so I didn’t have a lot of space. This story was relatively easy to write, both because it was short, and because the subject matter was fairly simple. The challenge was “writing tight,” or keeping my story succinct while adequately covering the topic. I kept my lead short, described the research, and included a quote from Dr. Jensen. It took me several drafts to get my original version, which was more than 250 words, cut to within word count. It had been assigned at 150 words and I wrote a 163-word piece. My rule of thumb is to get as close to word count as you can, but stay within 10 percent of assigned word count no matter what. The finished piece I turned in is below, with my comments in brackets. Note that my name, address and contact information are in the upper left-hand corner. The word count and rights being sold are included in the upper right-hand corner. Then the title of the piece and the byline are centered below that, before the story starts. You should single-space this information and double-space the piece itself. Step 8: Turn the story in. I turned in the story along with Dr. Jensen’s contact information and a copy of the study itself. This is called “backup,” or “fact-checking” material. Some publications don’t require backup, but I suggest you always have it on hand just in case. That will include the names and contact information of anyone you interview; copies of journal articles; websites that you pulled information from (e.g., a page from the Centers for Disease Control that you cite in the article.) For longer stories that include more than one source, you typically turn in an additional, annotated copy of the story that indicates which sources provided the information in the story. What comes next? Biting my nails and waiting to hear from my editor. Stay tuned for the remaining steps in the process. And don't forget about my free teleseminar with Rochelle Melander on Wednesday! If you're interested in writing articles, be sure to sign up for the Write Now! Mastermind class on Wednesday, March 27, at noon central time. 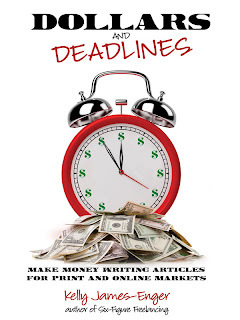 Rochelle Melander will be interviewing me for How To Pitch And Sell Articles To A Variety Of Freelance Markets. The call is free, but you need to sign up at http://www.writenowcoach.com/resources/write-now-mastermind.html. I hope to "see" you on the call! Welcome back to the sell-your-first-article series. (You'll find step 1 and steps 2 through 5 here.) Today we'll only be covering one step, but it's a critical one--step 6, interviewing your sources. Remember that for this short piece, I only needed to do one interview with one of the coauthors of the NEAT study. I'd already contacted him to see if he was willing to do an interview with me, and he was. 4. Was he surprised by this? Why or why not? 5. Take-away message for women who want to lose/maintain their weight? 6. Anything else you want to add that I haven’t asked? At the conclusion of the interview, I thanked Dr. Jensen for his time, and told him I’d be in touch with any further questions via email. I also asked whether he’d be available in the next month or two in case my editor had any follow-up questions. Finally, I promised him I’d be in touch to let him know when the story was published. And then I sent him a thank-you note via snail mail, expressing appreciation for his time. Scared about conducting an interview? I used to be, too. In fact, I’d say I was petrified I’d forget to ask something, or that I’d sound stupid (or both!) during pretty much every interview I conducted for the first year or two of freelancing. But I’ll tell you something—the person you’re interviewing doesn’t care about you sounding stupid—he’s more concerned about whether he sounds stupid. Keeping that in mind, I’d like to give you some tips to get better interviews, regardless of who you’re speaking with. First, always do your homework ahead of time. Second, let your source know that you have. I’ve interviewed hundreds of experts and real people over the years, many of whom are busy professionals. They may be willing to be interviewing, but that doesn’t mean they’re eager to be. As soon as I make sure that it’s still a good time for the person to speak with me, I demonstrate that I’m prepared to speak with him. So, for example, with Dr. Jensen, I told him that I’d already read the entirejournal article, but wanted some “live” quotes from him for the story. With another source, I might let him know that I’d visited his website or mention one of his books or some of his latest research. It depends on the source and the subject, but even with an anecdotal source, I can say something like, “Becky, thanks so much for agreeing to speak with me. I understand from Sarah that you’ve been homeschooling your kids for three years, and I had a chance to check out your homeschooling blog. Is this still a good time for you?” It’s that easy to start your interview off on a positive note. I always tell the person I’m interviewing how much time I’ll need (say, 15 minutes) and I stick to that estimate. Watch the clock. If the interview is going to go over, tell your source. “I’ll say something like, ‘You know, I told you I only needed 15 minutes to speak with you, but we’re about to hit that. Can we speak for a few minutes, please?” It’s another way of doing what you said you would, and demonstrating your professionalism. Finally, I always send a thank-you note. I mentioned that already but I’ll tell you that it’s made a huge difference in my career. Sources remember me! They remember my name even years later because, “You’re the one who sent that note!” People think of me as a professional, thoughtful writer—and there are much worse things to be known of in a business where your reputation may precede you. For this story, I only needed a couple of brief quotes from Jensen, so the interview took less than five minutes. My transcript included Dr. Jensen’s contact information and several short statements about the study. With the study and my transcript in hand, I sat down to write the story. That's step 7, which will be the subject of my next post! If you're interested in writing articles, be sure to sign up for next week's Write Now! Mastermind class. Rochelle Melander will be interviewing me for How To Pitch And Sell Articles To A Variety Of Freelance Markets. The call is free, but you need to sign up at http://www.writenowcoach.com/resources/write-now-mastermind.html. I hope to "see" you on the call! Last post, I introduced the 14-step process to pitching, selling, researching, and writing an article--whether it's your first or your fortieth. Step 1 is coming up with an idea for an article--and if you read this blog, you already know that I always suggest you pitch something you're uniquely qualified to write. Step 2: Choose the market. Idea in hand, I had to figure out where I could sell the story. In this case, I decided Fitness, a market aimed at fitness-conscious women in their 20s and 30s, would be a perfect fit, so I pitched it there first. In chapter 2, you learned about the different types of markets and how to locate potential ones. I like to start with my “first choice” market (usually the market that pays the most, or that I’ve written for before), but I keep a list of other possible markets in the event my first choice says no. If that happens, I move on and resub the query to another market. It’s easier than ever before to analyze a potential market; most print and online magazines now have their writers’ guidelines posted online. This is no substitute for actually reading the publication you hope to write for, however. Review your target market with a critical eye. What subjects does it cover? What types of articles (i.e., features, profiles, service, and short pieces) does it include? How long are the articles? How many articles does a typical issue feature? Do the pieces rely on a lot of expert voices, “real” people (think anecdotal sources), or a combination of both? What kind of “tone,” or voice, does the market have? Look at the ads, too; they will tell you more about the readers of both print and online publications. The more you know about the market, the more likely you are to pitch an idea that an editor will want to assign. Step 3: Write a query. Next up, the query letter. We talked about query letters in chapter 3. Remember that you want to capture the editor’s attention; explain why her readers will be interested; describe how you plan to approach the story; and demonstrate that you’re “uniquely qualified” (yup, there’s that phrase again!) to write the piece. If I hadn’t worked with Heather before, I would have confirmed the name of the editor who was in charge of the “Fit Buzz” section by calling Fitness and asking for her name and email address. (Today, you may be able to find this information from the publication’s Website. Otherwise, call or email to make sure that you’re contacting the appropriate person.) Then I proofread the query, and emailed it. Step 4: Get the assignment. In this case, I didn’t need to send a follow-up email. Just two weeks later, the editor called to assign the piece. She asked me to keep it to 150 words, and we agreed on a rate of $1.50/word for the story. I’d written for Fitness before, so I was familiar with the magazine’s multi-page contract. Otherwise, I would have wanted to read the contract and make sure I was comfortable with its terms before proceeding.